MCI specializes in the investigation and reconstruction of highway accidents which has included the development, refinement and utilization of computer programs. Brian G. McHenry has worked with Raymond since 1978 and has published over 16 technical papers and has taught and presented at many accident reconstruction seminars. McHenry Consultants, Inc.( MCI) is an accident/collision investigation/reconstrucution company formed in 1980 by Raymond R. McHenry and Brian G. McHenry. MCI specializes in the investigation and reconstruction of highway accidents which has included the development, refinement and utilization of computer programs. For over 35 years McHenry Consultants has continued research and development of computer models related to accident reconstruction. McHenry Consultants are experts in the state-of-the art of computer modeling and in particular the following areas: Accident Reconstruction, Vehicle Dynamics, Automotive Engineering and Occupant Kinematics. McHenry Consultants has investigated and reconstructed over a 1000 accidents since 1980 and has staff available to investigate and reconstruct any type of motor vehicle crash including those involving cars, trucks, motorcycles and/or pedestrians. We have a staff of consultants, accident investigators, reconstructionists and Professional Engineers, located in North Carolina and throughout the country who can quickly respond to your case file needs. In 2017 Brian G. McHenry was hired by Jaguar UK to design the 2018 Jaguar E-Pace Rollover Stunt. 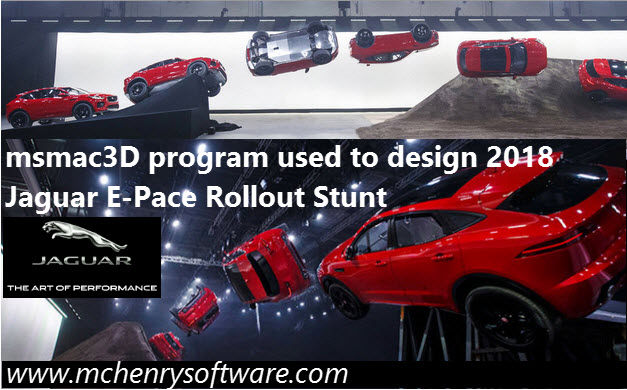 McHenry used computer simulation to modify the original spiral jump stunt for the 2018 Jaguar E-Pace vehicle. The stunt was where the 2018 Jaguar E-Pace was driven by a stunt driver up a ramp and rolled 360 degrees and landed on its wheels and continued driving down the road. 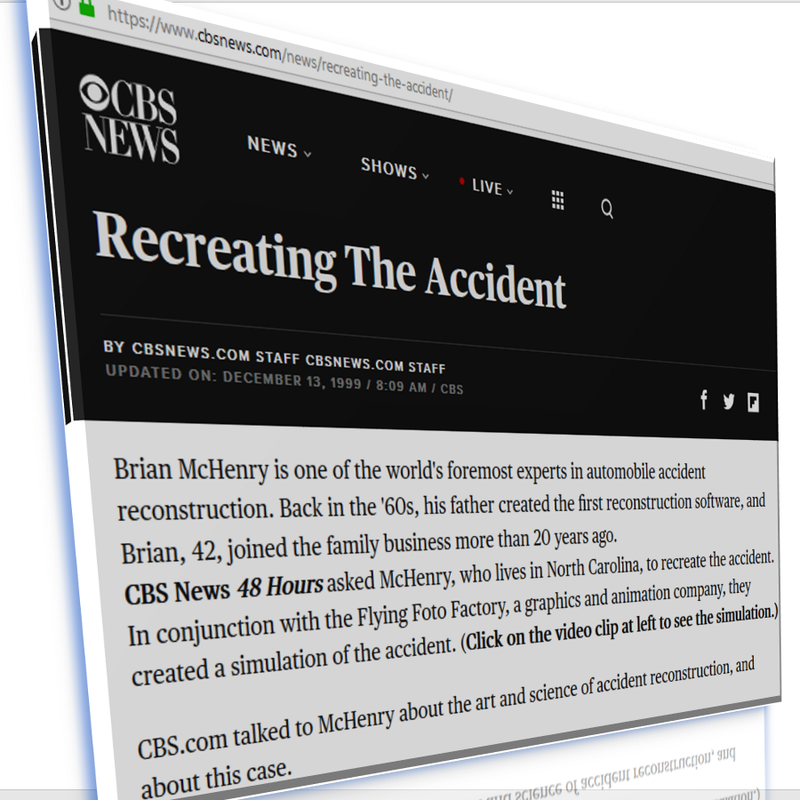 In 1998, Brian G. McHenry was hired by CBS News to reconstruct the Princess Di accident for the television program “48 Hours” where he presented results and answered questions in interviews broadcast on June 11, 1998 and August 31, 1998. The First Astro Spiral Jump is an auto stunt invented and designed in 1974 by Raymond R. McHenry [US Patent No. 3,814,021] that was also produced in James Bond Movie. m-smac, SMAC, and the various clones: WinSMAC, EDSMAC, m-crash, CRASH and the various clones: EDCRASH, PC-CRASH, CRASHEX, SLAM, WINCRASH, PC-CRASH. m-hvosm, HVOSM, and the clone: EDVSM. CVS/ATB, CAL-2D and the various clones: DYNAMAN, ATB-3I, GATB, MADYMO. Brian G. McHenry has worked with Raymond since 1978 and has published over 16 technical papers in the field and has taught and presented at accident reconstruction seminars. In 1998, he was hired by CBS News to reconstruct the Princess Di accident for the television program “48 Hours” where he presented results and answered questions in interviews broadcast on June 11, 1998 and August 31, 1998. Raymond R. McHenry was the principal investigator and analytical developer for CAL-2D, HVOSM, SMAC & CRASH. These programs form the basis for most of the vehicle dynamics, accident reconstruction and occupant simulation models available today. Mr. McHenry has published more than 45 technical papers and 40 technical reports. The Astro Spiral Jump is an auto stunt invented and designed by Raymond R. McHenry with m-hvosm [US Patent No. 3,814,021]. Prior to making a decision to retain our services, a client can request that we perform a preliminary review of file materials and call to discuss the case file. McHenry's have authored many Technical Reports, White papers and Articles. Please note many are still not listed here. 1992 "Simulation Models of Vehicle Dynamics", B.G. McHenry, presented November1987, National Conference on Future Improvements to and Supplemental Guidance for AASHTO Policy on Geometric Design of Highways and Streets; Published April 1992, Transportation Research Board Circular "Beyond the Green Book". 1967 "Determination of Physical Criteria for Roadside Energy Conversion System",R. R. McHenry, N. J. Deleys and D. J. Segal, Calspan Report No. VJ-2251-V-1,July 1967. 1985 "Safety and Operational Considerations for Design of Rural Highway Curves" (HVOSM Sections (3 megs), Full Report 14 megs!) (DOT-FH-11-9575, PB-86139664/AS); Glennon, Neuman and Leisch, December, 1985 (HVOSM Simulation work and sections in full report written by McHenry & McHenry). 1981 "National Crash Severity Study--Quality Control, Task 5. Analysis to Refine Spin out Aspects of CRASH", McHenry, R.R., and McHenry, B.G., NTIS Publication No. PB-81-180507, January 1981. 1976 "Yielding-Barrier Test Data Base - Refinement of Damage Data Tables in the Crash Program",McHenry, R.R., Calspan Report No. ZR-5954-V-1, DOT-HS-5-01124 December1976. 1976 "User's Manual for the CRASH Computer Program", McHenry, R.R; February1976, NTIS #PB 252115. 1976 "Extension and Refinements of the CRASH Computer Program Part I - Analytical Reconstruction of Highway Accidents", McHenry, R.R., NTIS #PB252114. 1976 "Extensions and Refinements of the CRASH Computer Program - Evaluation of Reconstruction Techniques for Highway Accidents", McHenry, R.R., February1976, NTIS #PB 252116. 1976 "CRASH II User's Manual", McHenry, R. R., and Lynch, J. P., November1976, ZQ-5708-V-4,NTIS #PB 262822. 1976 "User's Manual for the CRASH Computer Program", McHenry, R. R, January1976, ZQ-5708-V-3, DOT-HS-5-01124. 1976 "Mathematical Reconstruction of Highway Accidents - Further Extensions and Refinements of the CRASH Computer Program", McHenry, R. R., and Lynch,J. P., November 1976, DOT-HS-802-287, Calspan Report No. ZQ-5708-V-5. 1975 "CRASH2AUser's Manual", McHenry, R. R., and Lynch, J. P., (unpublished)Contract DOT-HS-6 -1442, Calspan Report No. ZP-6003-V-2. 1975 "A Comparison of Results Obtained With Different Analytical Techniques for Reconstruction of Highway Accidents", Society of Automotive Engineers, International Automobile Engineering and Manufacturing Meeting, Detroit, Michigan, October 13-17, 1975. Thank you for your interest in McHenry Consultants, Inc. Copyrights: McHenry Consultants. All rights reserved.